Pixie Dust Healing: Homeopathics: Never Run Out?? I had a "hit upside the head" moment the other day I thought I'd share. http://pixiedusthealing.blogspot.ca/2012/08/meteor-shows-and-chance-to-reset.html In some ways, it really didn't come out of "no where", maybe those revelations never do. Lots of people have been trying to explain this to me for awhile now I discovered. Once I got really excited about what I had learned, and was sharing it, they were nodding and saying "that's what I've been trying to tell you"! But for some reason, no idea why, I just suddenly "get it". Before I start to explain, there is a caveat to this blog posting. I still have memories of my early years of teaching paramedic students. What I learned the first day, and have not forgotten, is that it is a very different thing to know something and be very confident in your skill level than it is to know how to explain something and portray your skill level to others. So... let me try and explain this. So something like Arnica, http://pixiedusthealing.blogspot.ca/2010/10/crushed-fingers-homeopathics.html or Rhus tox., or Belladona, doesn't seem to last too long. And just when someone is sick and I know the perfect remedy for them- that's the one I'm out of because I've used the last of the vial and haven't bought a replacement. In my part of the world, it's not always easy to "run out and pick up the remedy you need". It can mean waiting till morning, or waiting till an order comes in, before getting the relief you're looking for. I sometimes figure that's just the universe teaching me patience, or it means that wasn't really the remedy for me anyway. Sometimes running out of a remedy has encouraged me to try something else that worked even better. But sometimes, I just really need more of a remedy and I wish I had it -right now. That opens up a world of possiblities. If you don't want to run out of that favorite remedy- here's a recipe. 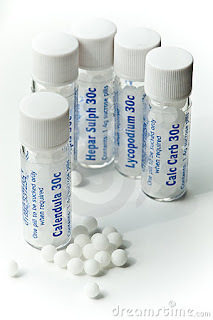 Take 2 pellets or tablets of globules of the remedy you want to multiply and never run out of. Put these pellets (without touching them with your hands) into a small dark glass bottle. The easiest bottle to work with is one that has an eyedropper lid. The dark color just protects the remedy from sunlight. Fill the bottle almost to the top (however big or small it is) with distilled water. Then add a couple of drops of alcohol as a preservative. 100% proof Vodka would be best. I haven't had any luck finding this. You can use brandy or 40% Vodka as a back up. Cover the bottle and hit the bottle gently against your hand 10 times to succuss the remedy and dissolve the pellet. Now you have a full bottle of your favorite remedy in the same strength as your original pellets. Instead of taking 2 to four pellets take 2 to 4 drops. That bottle should last you a much longer time than the vial would if you take new pellets each time. When the bottle gets low, refill with water and preservative, repeat the process and you're "good to go". Or, if it makes you feel better, take 2 more of the original pellets (because you haven't had to use anymore than 2) and create a new bottle again. A. You can disregard the whole idea, decide I'm crazy as a bag of hammers (another expression I grew up with) and go try and buy another vial of your remedy. C. You can just trust me and the recipe, follow the instructions, and don't think about it just try it. Years of taking and then creating multiple choice exams has led me to, if in doubt, "pick C", but you have a choice on that too. Sometimes it seems we make life so much harder than it has to be. Sometimes we think too much. Sometimes we apply rules and science in inappropriate ways. Sometimes the universe really is prepared to provide you with infinite supply.